With Thanksgiving already next week, I’m totally in the mood for all things holiday festive! Around this time of year, I love adding that little extra “something” to my looks: whether it be a fun feather accessory or throwing on a cape with a giant bow, there are no apologies from me for going over the top. It’s the most perfect time of year to do it, so why the heck not?! Are you guys ready for the holiday coming up? I feel as though we’ve all skipped turkey day and have gone straight to Christmas…am I right?! The color of this cape is divine and OMG that clutch! I looove the feathers! You look fabulous as always! And yes, it feels like we skipped Thanksgiving–we decorated for Christmas over the weekend! SO cute! This is probably my favorite look you’ve worn lately. The color is so rich and beautiful! You look fabulous! Love this color on you! Looks lovely! Love your outfit! What a great set! 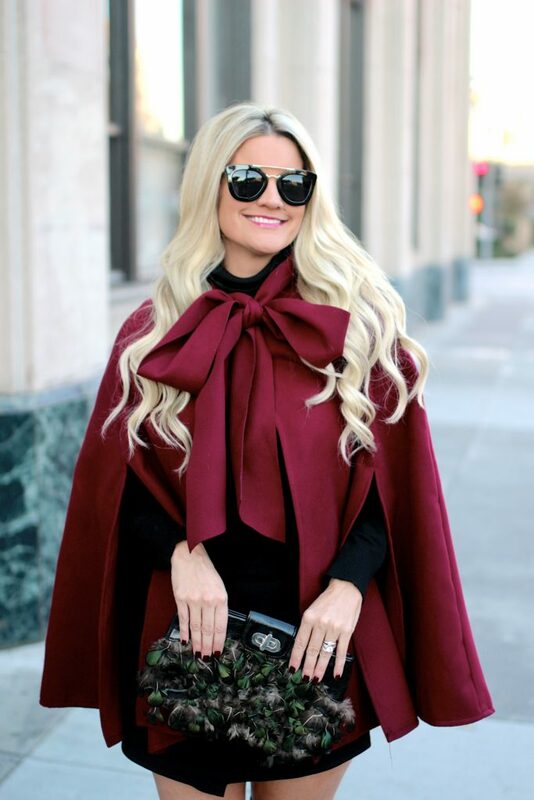 I love that cape – never would have thought to look at Shein for a cape! Like I said on instagram this is my favorite time of year on your blog. You always have such unique pieces for the holidays and I love to see how you style them! The color of your cape is gorgeous! I love the bow detail! Such a cool coat! I love the style and the coat! You look fabulous! You are like the Little Red Riding Hood of SUPER CHIC! I love this! I totally feel you as in skipping Thanksgiving, oh my! LOVING this festive look! You always have amazing coats and bags!! Happy Wednesday friend! Shauna, you never cease to amaze me! Love the cape! So perfect for the upcoming holidays! Shut the front door that cape is BEAUTIFUL! Need!! This cape is SO fabulous! I love the big bow and the color is perfect for Christmas time. Oh,that cape is so pretty. Perfect for the holidays. you look awesome as always, I like that burgundy color, and love that feathers covering clutch. Oh my, this looks sooo adorable on you dear! Love the color too, burgundy is absolutely perfect on you! Ooo, love the feather clutch, how special and this is such a glam look with you beautiful cape and OTK boots, Love your holiday look! Such a beautiful cape! Iove the colour and the big bow! Thanks for linking up!